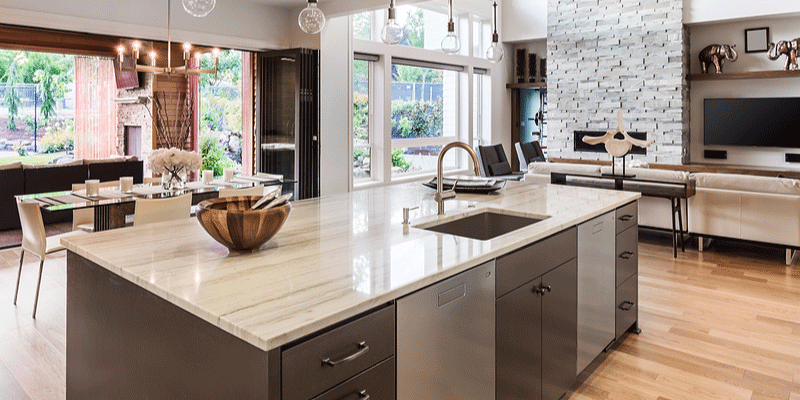 Granite Vs. Marble Countertops: Which Is Best For Your Kitchen Renovation? 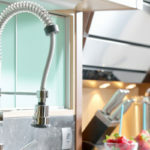 Kitchen Cabinets and Granite Countertops, Pompano Beach FL > Blog > Blog > Granite Vs. Marble Countertops: Which Is Best For Your Kitchen Renovation? Granite countertops require less maintenance and are more affordable than marble countertops. Also, since granite is a harder material it’s more durable. While both materials are gorgeous and can be found in high-end kitchens and luxury homes, how do you decide which is the best option for you? 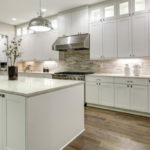 Here’s a look at what sets granite and marble apart, as well as what they have in common, so that you can make the best decision for your kitchen renovation. Technically speaking, marble is a metamorphic rock that is formed by recrystallized carbon. It originates as limestone but after being subjected to tectonic shifting, which causes extreme pressure and high heat, it transforms into marble. Granite is an igneous rock made up of grains of mica, feldspar, quartz and other types of similar materials. Both marble and granite are natural stone materials that make a beautiful countertop surface. For the most part, natural stone has the ability to surpass most other materials with the right care and maintenance. Both materials are porous, which means they readily absorb things deep within their surface. Without the right sealant this makes both surfaces more prone to stains. A new coat of sealant should be applied every few years to help lock out moisture, oils and other potential stains. Granite is made up of different grains of materials, and you can actually see these grains in granite surfaces. That’s why granite has so many unique patterns and color variations. One single slab of granite may contain a wide variety of colors including blue, green, pink and orange. Marble has more consistent coloring with sporadic veins running through it. For instance, a light slab of gray-blue marble may have darker blue veins running through it. The color of the veins is typically in synch with the color of the slab. It’s impossible to say which is more beautiful. Some people find marble more attractive, while others are more drawn to granite. It all comes down to personal preference. Durability: Is Marble Or Granite Stronger? Granite is a harder material than marble. That means right out of the ground, granite is more durable and resistant to scratches and chips. If you tend to be tough on countertops, you may want to go with granite in order to reduce the risk of scratches and other surface injuries. Both materials are fairly resistant to heat, but that doesn’t mean you should put your hot pans directly on either surface. Always use potholders and never place anything hot directly on surfaces because heat damage can occur. Experts are in agreement that in comparison to tile, glass, laminate, and quartz, granite requires moderate amounts of maintenance. Marble, on the other hand, requires moderate to high amounts of maintenance. In other words, you can expect to spend more time and money maintaining marble countertops compared to granite. Both granite and marble require regular sealants every couple of years in order to prevent liquids from penetrating the surface and staining countertops. After the original seal chips away, and it will, surfaces can be easily stained by oil, wine, juice and anything acidic. Marble is even more sensitive to acidic foods and liquids than granite. Keep damaging liquids off of surfaces as best as possible and clean them up immediately when they do come in contact. Marble is more expensive than granite by about 25%. Purchasing wholesale granite countertops through Tops Kitchen Cabinet will save you a ton of money, as much as 50% or more off the cost of retail marble. You prefer the look of granite. You want a greater selection of colors and patterns to choose from. You tend to be tough on countertops and need a surface that can keep up with your fast-paced lifestyle. Your countertops get a lot of wear and tear/ a lot of people use your kitchen. Your countertops get dirty fast. 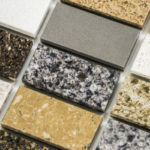 Granite is great at masking dirt and debris thanks to its vibrant color patterns. You prefer the look of marble. You don’t mind spending more money to purchase marble countertop slabs. 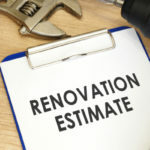 You don’t mind spending more on maintenance over time. You are fairly careful with your countertops and are not concerned about scratches or dings. You clean a lot and know you are capable of preventing the formation of stains on light marble surfaces.